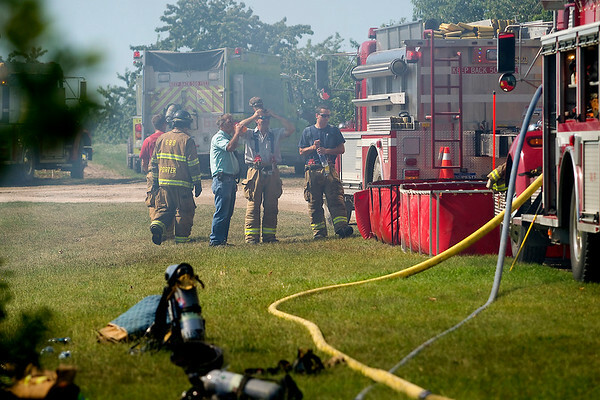 Firefighters take a water break outside a Suttons Bay home that burned on Tuesday morning. No one was injured, but a family dog was lost when a fire broke out in the home on South Donnybrook Road shortly before 8 a.m. on Tuesday. Suttons Bay-Bingham, Leland, Leelanau Township and the Grand Traverse Band of Ottawa and Chippewa Indians Fire Departments responded to help contain the blaze, which was fully engulfed when they arrived. The fire is believed to have started in the kitchen, but the cause is unknown. The house was a total loss.